Acne Scar Treatment: Many men and women who have had severe acne during their lives are often left with deep, depressed scars that do not go away without treatment. Acne scars leave profound negative psychological effects on any individual. 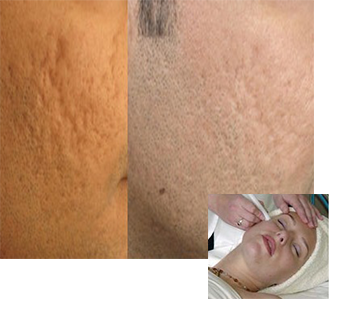 Acne scar improvement requires special combination of treatments. At Care Well Medi Hub, we have a variety of advanced laser treatments to address nearly all types of acne scars. Er :Glass laser: it is a non-invasive way to treat acne scars. This laser does not cut or remove skin surface so there is no down time means you can return to your normal activities on the same day. New Fractional CO2 laser: It is unique in that it does not remove all the top layer at once and actually remove columns of skin, therefore recovery time is shorter which is about four to seven days. These lasers can also be combined with Med chemical peels or micro surgical procedures: Punch excision surgery is an option for individuals with deep “ice pick” scars that have not improved with laser surgery. Subcision is a procedure that involves using a needle to get underneath the scar disconnecting the fibres under the scar. Chemical Peels: for mild to moderate acne scarring. A glycolic Peel or Trichloroacetic acid Peel is used. Dermal Fillers filling-material injections are also used for the treatment of acne scars. At Care Well Medi Hub, depending upon the type and extent of scars, dermatologist would decide whether you require a single or a combination of treatments. We have all these advanced treatment modalities available to fulfil your own personal goals.